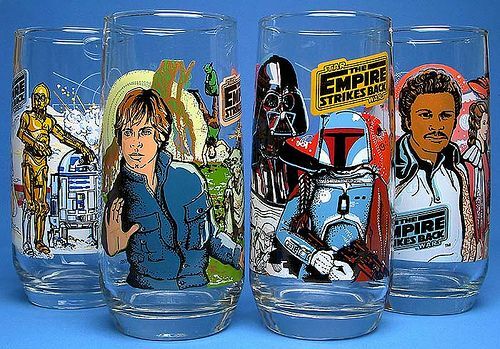 I have a series of really nice glass cups with each one featuring a different character or scene from either Empire Strikes Back or Return of the Jedi that were original promotional tie-ins to the movies from Burger King that are my most prized Star Wars collectible items. 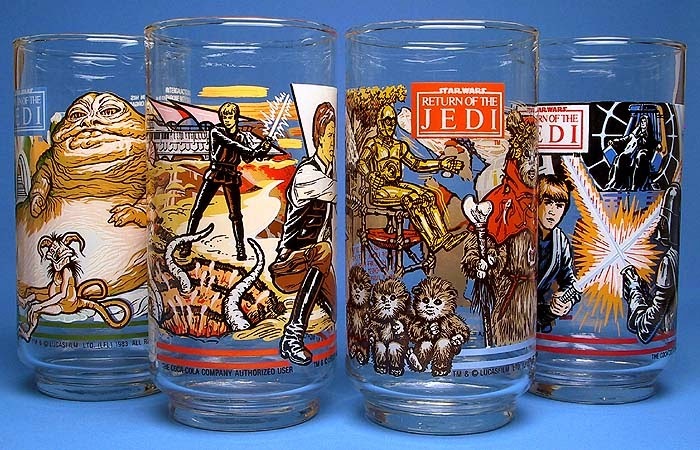 Over the years, I've picked up a variety of fun and interesting movie tie-in promotional items from fast food restaurants such as BK, KFC, McDonalds, and Taco Bell. Fans of Marvel, Pixar, Star Wars, and Walt Disney movies may have noticed these promotions aren't as prominent as they used to be with fast food restaurants when it comes to these films. That's because Disney's MAGIC OF HEALTHY LIVING INITIATIVE started in 2010 which has a mandate of improving healthier eating options for children ages 6 - 13 and their families. A major component of this initiative is that Disney won't enter into partnerships with fast food / quick serve restaurants whose menus don't meet the company's nutritional guidelines for providing healthier eating options for kids and their parents. So that's the reason you haven't seen a Captain America: Civil War, Star Wars: The Force Awakens, or Zootopia kids meal toys or other movie cross-promotional items at many of the fast food restaurant chains lately. 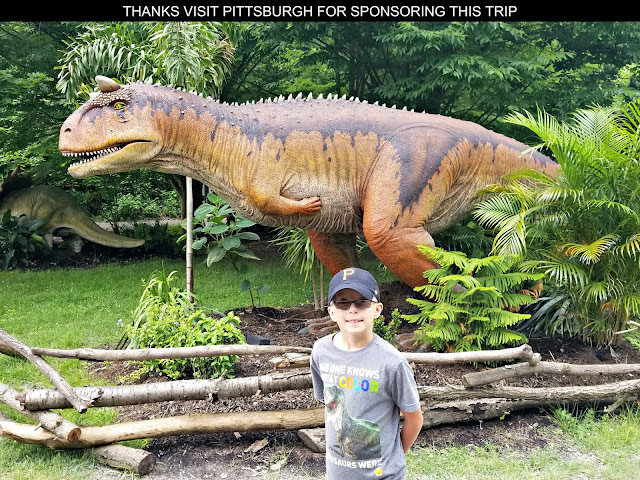 One restaurant that has met the Magic of Healthy Living Initiative criteria though is SUBWAY so if you want to find some fun tie-in items to upcoming Disney movies that is the place to go. 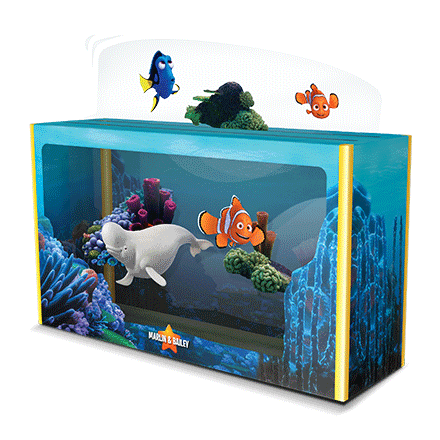 If your family is looking forward to the Finding Dory movie than you'll want to pick up a SUBWAY kids meal. Finding Dory floats into theaters across the United States on Friday, June 17, 2016 and SUBWAY restaurants, the largest Disney-endorsed quick service restaurant (QSR), is celebrating the arrival of this highly anticipated sequel to the beloved Finding Nemo with six collectable Finding Dory 3D scene-makers. 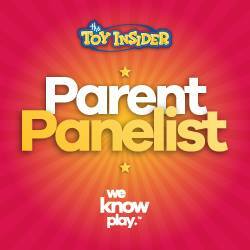 Shaped like a diving mask, children can shape their own unique scenes featuring characters from the film and then pretend to swim underwater imagining their own Finding Dory adventures. 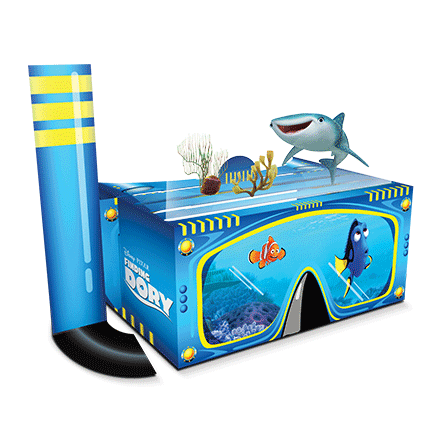 Children will find one of six collectible Finding Dory 3D scene-makers in a SUBWAY Fresh Fit For Kids meal. In addition to the including the 3D scene-maker, each SUBWAY Fresh Fit for Kids meal includes a handcrafted sandwich customized with veggies and lean meats on freshly-baked bread paired with fresh apple slices and low-fat milk or water to drink. This new campaign is the latest collaboration of many between Disney and SUBWAY (previous include Star Wars, Zootopia, Inside Out, Avengers: Age of Ultron, and Frozen).